Earth Stopped in Orbit for 9 years: The How and Why. 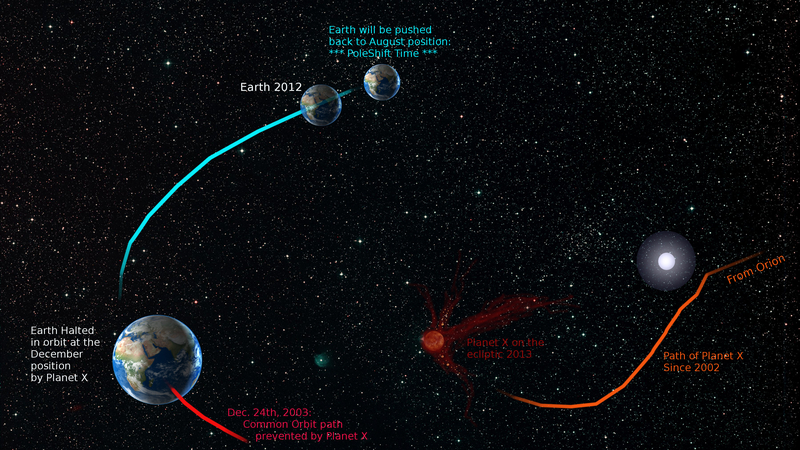 The composite image above shows the basic details of the entry of Planet X into our solar system, it’s path since 2002, Earth’s orbit stoppage and subsequent push-back. The image is not-to-scale thus truncated to include all elements. The position of Planet X doesn’t appear to be close enough to halt Earth in orbit, but nevertheless has in fact. The story goes like this: Planet X entered the solar system from the direction of Orion at an angle of 32° from solar system south sometime late 2002, then migrated rather quickly somewhat under but to the “right” of the Sun to pop up like a jack-in-the-box to the ecliptic near Earth’s orbit. Information is taken from ZetaTalk.com – Art is by Chris Thomas. To my mind, the most fascinating effect Planet X has on Earth to date is the fact that Earth has been halted in her orbit of the Sun. Fact I say?, Well read on for the details, supporting ZetaTalk and discussion. The Zetas of ZetaTalk broached this subject on August 2003 with a poignant statement: “Orbits are not sacred“. They go on to explain that planets can migrate to many orbital positions and Life does continue unabated as long as the new orbit is not too extreme for the denizens of that particular planet, furthermore they would rarely even notice. This probably doesn’t happen very often in the history of a planet of course, but it can, that’s the point. How exactly did Planet X cause Earth’s orbit stoppage and why is it that we are still seeing our yearly seasons? Well, before we jump right in, let me lay some ground work first. The Zetas have said that: “If the Sun bullies Planet X, Planet X bullies the Earth“, this statement sets the tone for an understanding of one the main relationships between the Sun, Earth and Planet X. Moving into more detail, let’s look at the other important Earth-Change factors that came into play with the rogue planet entering our Solar System. U.S. 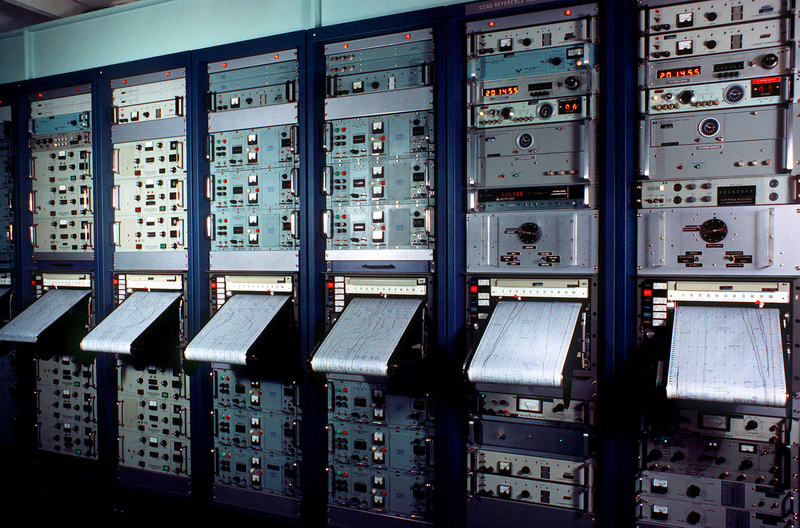 Naval Observatory Master Clocks in Washington, D.C.
Did you know that the U.S. Navy has control over our time-keeping (timescale) with massive and highly intricate atomic clock interconnect system? Adjustments to “the time”, all-be-it in tiny portions, are done routinely, but since all atomic clocks are under control of secretive government agencies, there is no way for the public to know. As Planet X nears and the days lengthen, these clocks will be adjusted to keep the public clock in denial. Obviously, Earth rotation continues as it has no reason to stop, yet. The Zetas had calculated that Earth slowed her rotation by 37 minutes at the arrival of Planet X in 2002, which was subsequently compensated for by periodic adjustments by the U.S. Navy, the master clock keepers. There is also Earth Wobble which is due to Earth’s uneven magnetic field and according to the Zetas, has been occurring since about 2004 and has since then developed into a complex double wobble which by now (early 2013) includes other gyrations: Earth’s continents take a double-lateral hit each day from a magnetic tug on the Mid-Atlantic Rift: once when the Sun is over the Atlantic and a second time, when it is in it’s opposite position passing over the East Pacific. Yet, key to the orbit stoppage of Earth is the Zeta-fact that Earth is caught in a particle flow cup. (See 1st top image)The story goes like this: Planet X entered the solar system from the direction of Orion at an angle of 32° from solar system south sometime late 2002, then migrated rather quickly somewhat under but to the “right” of the Sun to pop up like a jack-in-the-box to the ecliptic near Earth’s orbit. 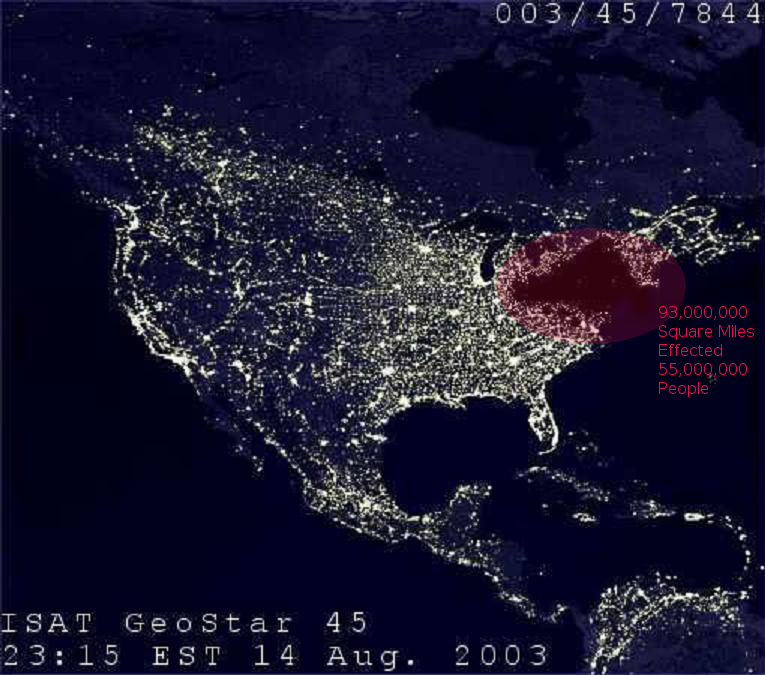 Because of the great speed of entry and the resulting dramatic slow-down due to repulsion force (gravity backwash), the tail of Planet X swept forward past Planet X and close to Earth causing the “Northeast Blackout of 2003”. (See 1st top image)The story goes like this: Planet X entered the solar system from the direction of Orion at an angle of 32° from solar system south sometime late 2002, then migrated rather quickly somewhat under but to the “right” of the Sun to pop up like a jack-in-the-box to the ecliptic near Earth’s orbit. Because of the great speed of entry and the resulting dramatic slow-down due to repulsion force (gravity backwash), the tail of Planet X swept forward past Planet X and close to Earth causing the “Northeast Blackout of 2003“. 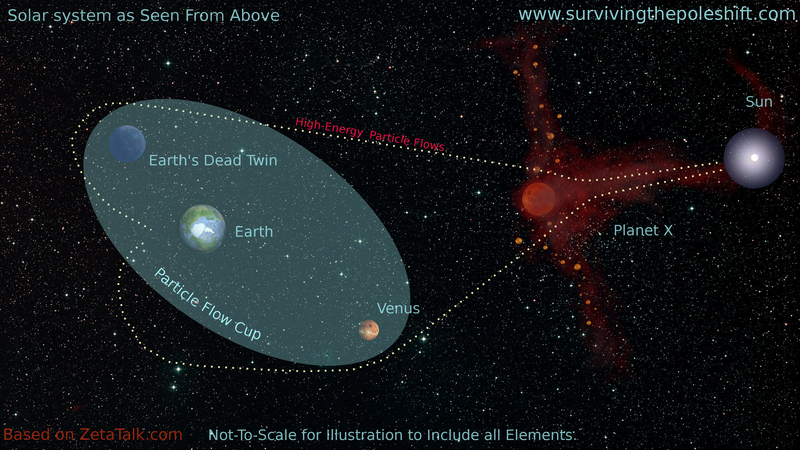 Because of the Sun’s rotational energetics, Planet X always assumes a retrograde orbit (in other words: an opposite rotational and orbital direction) when segueing through our Solar System, this resulted in a stand-off between Earth and Planet X. Since Planet X is 23 times the mass and 4 times the size of Earth, Earth just came to a halt (as if you came upon a large fallen rock standing in your way on a narrow pathway). But something else began to happen when Jack the Planet appeared, instantly the powerful particle flows from the Sun and Planet X, that are particularly intense on the ecliptic, began to flow around Planet X forming a powerful leeward back eddy of flowing atomic particles grasping Earth and preventing her from wending her orbital way around Planet X. To see this in your mind, imagine setting and holding a stick down into a stream of water, the water will form a turbulent back eddy “behind” the stick in the lee riverward, this is exactly what is happening, only in the case of Planet X particle flow “cup” the water is cosmic wind plus other flowing atomic components and the stick is Planet X popping “up” from below the ecliptic. Determining orbit stoppage for ourselves is not so simple as casually looking at heavenly objects in the sky, since the Sun, for example, is always at the center of Earth’s orbit. However, with a closer look, the Sun-arc, rising and setting times and the ancient seasonal profile of sunset and sundown orientations is key to proving that something is amazingly causing an out-of-place Sun. Additionally, the Moon is out-of-orbit, but this is because of particle flow crowding on the ecliptic due to the nearby presence of Planet X and has nothing to do directly with Earth’s orbit stoppage. This leaves the stars. All stars are so far away they are far beyond the effective binocular stereopsis of the human eye (ability to resolve distance), so observing stars individually for differences is impossible for the naked eye. However, the two dimensional star patterns studding the dark canopy we are used to seeing on a clear night have been anecdotally reported to being out of place for years (but to expect this to be officially reported by astronomers is folly, at least at this time as the cover-up of the existence of Planet X is still in full swing). Certainly the position of the solar system planets and star constellations, the rising and setting of which is documented, can be used to prove that something is out-of-kilter, but not orbit stoppage! This link will take you to a U.S. Navy online form to investigate the evidence for yourself. On a clear day or night, Earth wobble is most likely the cause of out-of-place skyward observations, it shifts our perspective with changes in Earth tilt more than 10° within an hour or so. This my guesstimate from the Zeta-fact that Earth’s North pole is pushed back over the horizon once a day (Magnetic North has a current inclination of slightly less than 10° from Earth’s rotation axis): an Earth-wobble axis tip. Yet with the wide angle Earth-wobble it is still hard to notice with the naked eye, unless landmarks are used with documentation. Imagine standing on a clear night looking up at the full moon: this image perspective puts you poised in space directly to the “left” of the full moon. The ecliptic is the plane that we see the Sun travel on during the day, the orbital plane of the moon is naturally tilted by 5° and since we are arbitrarily in the August position, the Moon’s orbit is even more tilted towards the Sun, due to Earth’s natural tip towards the Sun with a Northern Hemisphere summer. As the Moon transits from it’s Full phase to the New Moon phase, it’s directly bucking the solar wind (orange arrows) which is vastly more active due to the presence of Planet X on the ecliptic. 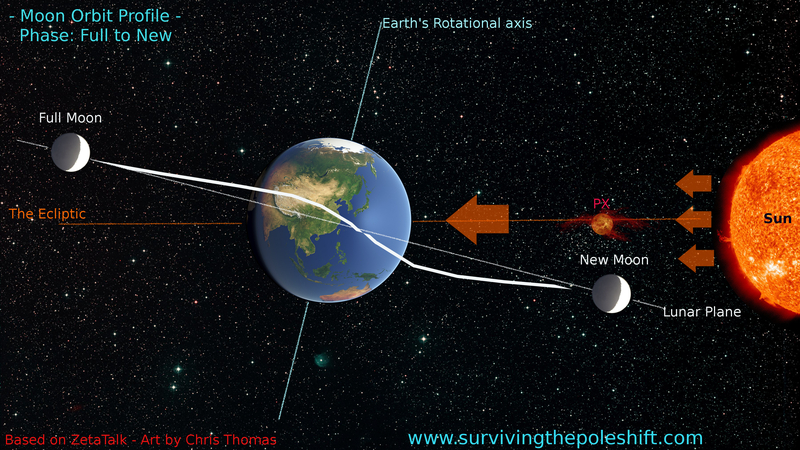 Since the Moon is moving against the flow of the Sun’s particle flows, as it gets near the ecliptic it’s pushed away (arcs higher in the sky), but it eventually has to pierce through the ecliptic to continue it’s orbit of the Earth, so it dips through at a steeper angle and bobs below (arc lower in the sky) sooner and farther than is normal for a moon orbit. The white curved line is a conservative estimate of the Moons aberrational orbit from Full to New Moon phase. To fully grasp the breath and depth of what it means for a planet to be stalled in orbit, besides the massive concepts that poke far out of our belief systems as humans in these days of Earth’s history, it helps to consider the spiritual implications. As many humans are also Soul supersisting on far higher scales, the current behind-the-scenes poleshift work that is being done must also encompass the Soul-lives of people and not just the current physical three dimensional incarnation. A great deal of care goes into these considerations requiring a vast amount of resources, which is why we have the massive UFO – ET presence, of which we only “see” a tiny portion of the whole of the available that is ready to provide the assistance when called upon. If there is one single spiritual reality that dominates the whole of the activities of all ETs and higher spiritual beings assisting Earth and Earth societies, it is the maintenance of the element of doubt. This is a “Council of Worlds” directive (the Spiritual ruling body of Earth) which is ruled with a lovingly-gloved but iron hand with occasional exceptions being granted. The element of (Human) doubt is the essential aspect that prevails over any possible impinging interference of all those who are working to help mankind and all tasks they are performing. The Zetas of ZetaTalk have said that the goal is to “prevent panic in the establishment, premature imposition of Martial Law“. The Zetas have explained many times that if any powerful ruling societal body on Earth were to become triggered into panic, supra-laws (such as marshal law) would be immediately levered against the public. This would be a cacophony of trouble, confusion and unnecessary death for many people. This clamp-down of authority would exceed anyone’s expectations: a militarized government control of organized wardens exercising a jail-like control across the patchwork of prefectures of the land. So, the public is kept in a fuzzy grey zone by preventing absolute surety of knowledge: Parents that cannot pay the rent and have to move do not (usually) don’t tell their children, they just move and make do. The children knew something was wrong the whole time, but they live with the element of doubt. We aren’t children, so we are free to research Planet X, examine the evidence and observe what we are “told” by such agencies as NASA and make our own opinions and choices and act accordingly, that is one important difference. Still, the question remains: “Why have we been experiencing seasons around the world since the Earth orbit halt of December 24th, 2003? The simple answer is that the Zetas are tipping the globe! Ironically, the Zetas explain that as they manipulate our seasons by shifting Earth’s axes, this creates opportunities of discovering the cover-up that takes us back to the canopy of stars. Of course, to those newly looking into Planet X and the poleshift, this may seem too far-fetched: to you I extend a welcome to the bigger world beyond human understanding but within the wise acceptance of possibility, besides to reject this explanation would mean you would have to reject the entirety of ZetaTalk, its debunking has been tried and failed many, many times, which is why ZetaTalk is still going strong. If one does a reasonable study of ZetaTalk.com, you cannot help but at least begin to question the explanations of Earth changes by the scientific status quo. With an even closer study, you will find the accuracy of the ZetaTalk dialogue and see the inconsistencies and the lies of established science against the plethora of Earth change events. Searching for one’s own proof of this cannot be a simple as looking at the skies unaided with some kind of technology, yet on the other hand, a 100 % manipulation of the globe against the old-natural position of the stars is not possible, there are far too many factors at play. For those denizens of discovery I recommend a sextant. One opportunity here, is that at either solstice Earth’s North Pole is tipped the furthest away from the North Star (Polaris) so as to emulate a winter or a summer, this exposes the manipulation, all be it subtly. Obviously these adjustments by the Zetas have to be made consistently throughout the year and there are many repercussions to be mitigated since Earth’s rotational axes posture is being constantly moved: the constellations need to be at the right location and at the right angle, therefore measurement to expose this is possible if one wants to go the the effort. Another focus, which is easier for the investigator, is a study of the much more obvious sunrise and sunset times and their respective locations, this can be done via a U.S. Navy website. One might ask why amateur astronomers do not notice these astronomical inconsistencies? But first, you have to understand is that astronomical instruments are calibrated against other heavenly bodies which also means that to check if a star or the Sun is out-of-position, you have to check against a landmark. Certainly, if they do happen to notice an inconsistency , what influence would they have against the professional astronomer no-talk rule? I have personally met a young astronomer (about 2009) who told me that 7 years previously he was doing some work in an astronomical observatory and was explicitly told not to point the telescope at a certain portion of the sky, it was forbidden! The North Celestial pole is the concept of the point in space that the Northern component of the Earth’s pole axes “points at”. Shown in the bottom right is a typical sextant, a device for measuring the distances between heavenly objects or a heavenly object and a landmark, day or night. This entry was posted in Orbit Stoppage and tagged biblical prophesies, chris thomas, crust shift, crustal shift, earth orbit halt, Earth Pole-shift, earth poleshift, earthchanges, effects of the poleshift, end of days, end of the world, kolbrin warnings, moon aberrations, moon out of orbit, nibiru, orbit halt, orbit stoppage, planet x, pole shift, PoleShift, surviving the poleshift, the poleshift, zeta talk, Zetatalk, zetatalk orbit halt, zetatalk prophesies. Bookmark the permalink. ← Russia, Suffer the Little Children. Hi Kaz, well you are the one who inspired this and now I know why the moon rides high and low between full new! Thanks to you. wow ,you have left me speechless……..amazing ,i knew there was something up ,you have explainedd it perfectly,i am in australia and i have noticed the moon is not quite right ,every thing adds up there is so much craziness going on and we are finally starting to find out the real reason ! this world just got very interesting,thank you namaste ! Hi Julie, thank you very much. Your response typifies the reason I blog on ZetaTalk, as to read ZetaTalk often requires too much effort and concentration for the neophyte to absorb. If the so-called “Zeta’s” are tipping the globe to emulate the seasons then why do I see the north star in the exact same place year round. I have a rather large telescope and a Polaris scope for which I wrote a program in 1987 to calculate the position of Polaris relative to the actual celestial pole of the Earth. 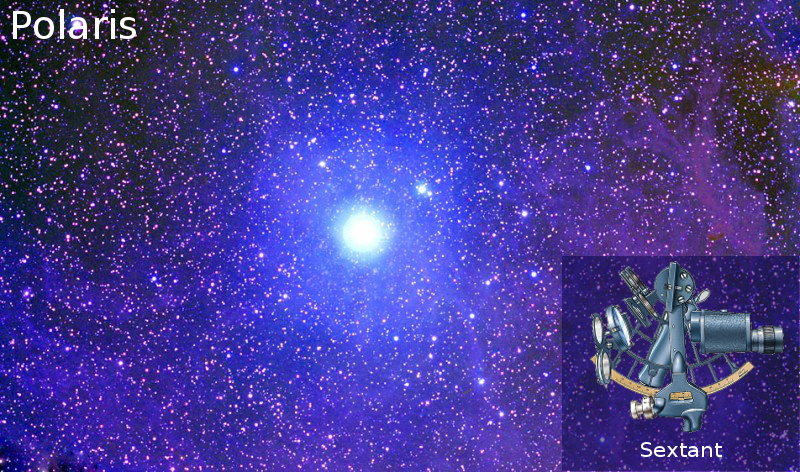 There is no evidence to me that the North Star Polaris has moved. It sits regularly in the sky directly out my front door. Jack, try calibrating your telescope to a point on the horizon or some Earth-based point. Of course the North Star will always be found at it’s coordinates relative to the “star map”, it’s Earth’s relative position to the stars that is changing. So if you can orient to the ground, you will find differences. Besides, there’s lot’s of anecdotal reports from reliable people who are seeing sunshine in here-to-fore sunless areas of their homes and gardens. Many more of these type of reports also exist: Sunrise, sunset times off, unusually shaped sun arches and sunset/sunrise coordinates also being reported “too far northward”. To clarify my last post. The North Star, Polaris is .8 degrees off from the actual celestial pole of the Earth. Every day it makes one revolution around the celestial pole. I wrote my program to calculate precisely what position (in degrees) it will be at any given time. This is for the purpose of dialing in my Polaris Scope and then aligning my telescope so the rotation is in perfect alignment perpendicular to the Earth’s axis. This makes tracking celestial objects possible with the built-in 24 hour sidereal motor. Thanks Wael. Well, the post at Earthchanges Facebook has been removed, however this is no surprize to me. Anyway, I replaced that photo (in my post) with a”water marked” one. Thank you again. In your opinion, is it worth trying to find a safe zone to prepare for the shift? 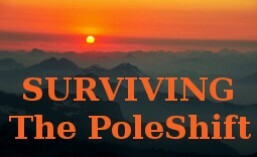 I am a skilled survivalist with notions of what it may take.